A very small kit mod I made in a couple of days for the 3e prestige class, Arcane Archer. Still in playtesting stage though mostly working. ARCANE ARCHER: Master of the elven warbands, the arcane archer is a warrior skilled in using magic to supplement their combat prowess. Beyond the woods, arcane archers gain renown throughout entire kingdoms for their supernatural accuracy with a bow and their ability to imbue their arrows with magic. In a group, they can strike fear into an entire enemy army. - +1 to hit and damage rolls with any missile weapon at level 1 and every 5 levels afterwards. - May use Enhance Arrow ability once per day per 7 levels. ENHANCE ARROW: Using arcane magic, the arcane archer can enchant his arrows. For 1 round, all arrows fired by the arcane archer deal 1d4 magic damage. 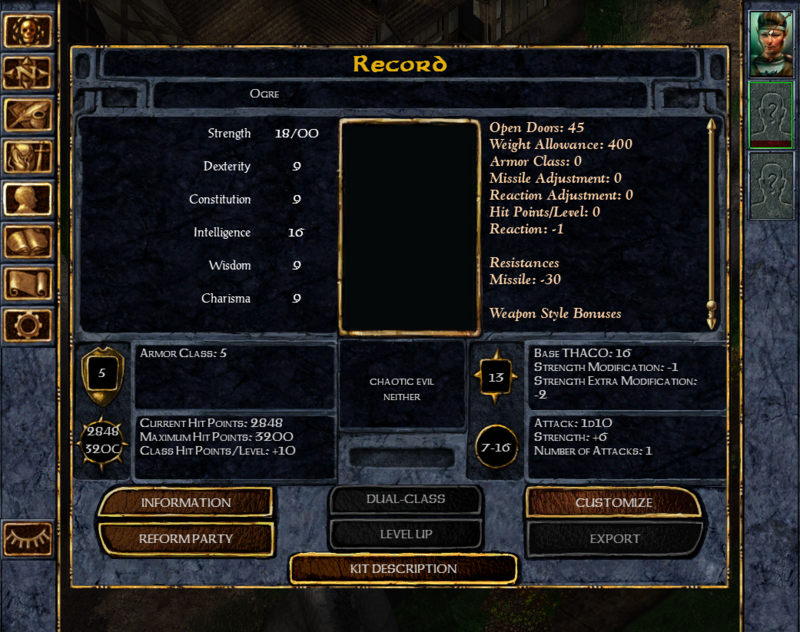 The damage increases to 1d8 at level 8 and 1d10 at level 14. - 5th level: May use Imbue Arrow ability once per day per 7 levels. IMBUE ARROW: Using arcane magic, the arcane archer can imbue his arrows with an area spell. For 1 round, all arrows fired by the arcane archer explode dealing 1d6 fire damage plus 1 damage per level (save vs. spell for half). - 9th level: May use Seeker Arrow ability once per day per 7 levels. SEEKER ARROW: A skilled arcane archer can launch an unerring arrow to any target known to them in their range. For 1 round, the arcane archer gains +20 to hit rolls on ranged attacks. - 13th level: May use Phase Arrow ability once per day per 7 levels. PHASE ARROW: An experienced arcane archer can launch an incorporeal arrow that penetrates armor. For 1 round, targets struck by the arcane archer lose 10% cumulative resistance to missile damage for 3 rounds. ARROW OF DEATH: A master arcane archer can launch a powerful arrow that can instantly strike a foe dead. For 1 round, targets struck by the arcane archer must make a save vs. death at -2 or die. - May acquire more uses of all abilities as HLAs. Extra uses of Arrow of Death are limited to two. - Rolls d8 for hit points instead of d10. - Race restricted to elf or half-elf. - Minimum DEX of 15 required. - Minimum INT of 14 required. - May not exceed proficiency (one slot) in weapons other than longbows, shortbows and crossbows. - May not acquire the following HLAs: Deathblow, Greater Deathblow, Hardiness. - Imbue Arrow doesn't scale with level. It should deal 1d6 +1/level but currently only does 1d6+5. I'm not sure how to fix this, as there seems to be no way to make the Cast Spell effect take your level. I may keep it this way as firing multiple 1d6+20 fireballs in a round at high levels seems a bit overpowered. - Can't get the d8 hit point roll to work. Still figuring it out. 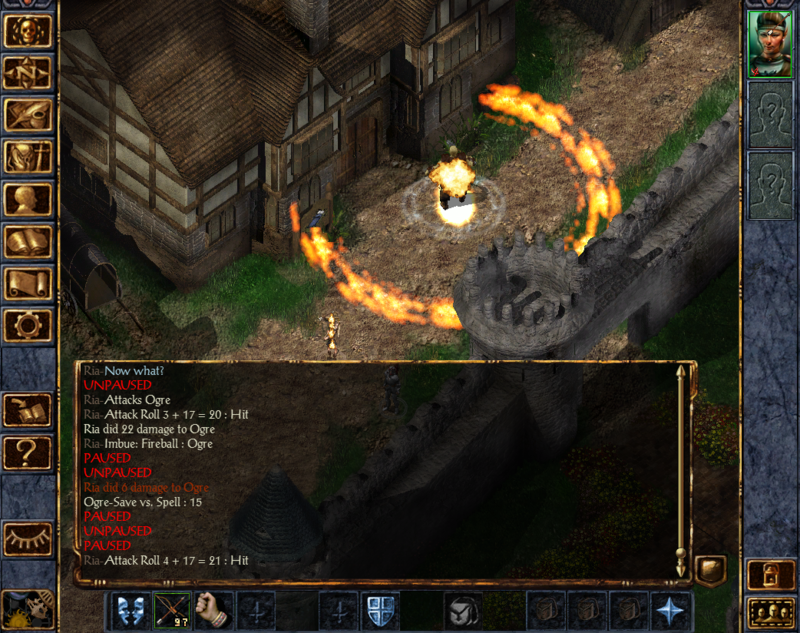 - Choose your own effect for Imbue Arrow in an Enchanted Weapon style list: fire, cold, magic, even dispelling! 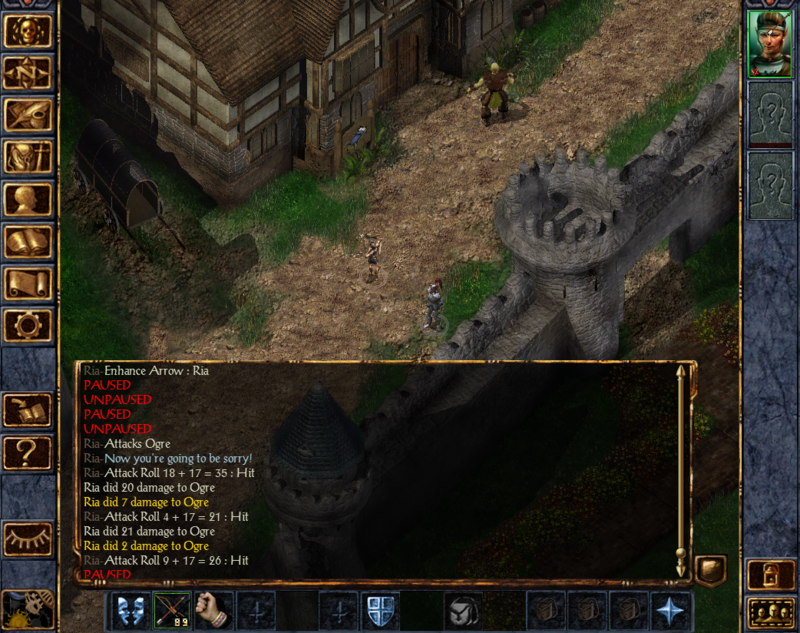 - Enhance Arrow by 3e rules innately enchants normal arrows (so an unenchanted arrow can hit as a +5 weapon). 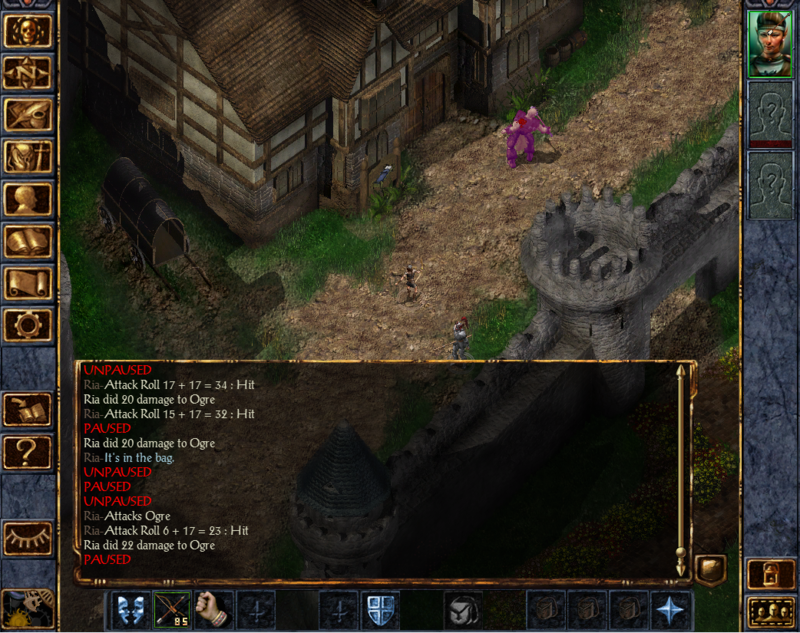 Can't be done in the Baldur's Gate engine, so I made my own variation of the ability. Comments: I know the vanilla kits aren't the definition of balance, but I would like to make this a viable choice over the Archer, and vice versa. It has slightly lower prowess in combat in exchange for some cool effects on its attacks. I'd appreciate people giving this kit a run and deciding whether it's a balanced and usable kit for the game. - v1.0 - Completed mod. - v1.1 - Ability effects prettified slightly, Phase Arrow fixed to allow magic resistance. I think you could simply create a handful of arrows in the PC's inventory that are +5 enchantment, but with no combat bonuses, and which disappear after a few turns. Like the darts from the Cloak of the Stars. A little more work to use, since you'd have to equip them, but it would come closer to the ability described above. I know the vanilla kits aren't the definition of balance, but I would like to make this a viable choice over the Archer, and vice versa. - Is this a Ranger kit? I assume so, but it doesn't say anywhere. - You know that "minimum" stats in BG only create higher rolls, and thus are a big advantage, not a disadvantage? I would eliminate those, or at least move them to the advantage list for the sake of clarity. - I like the d8 hit point rolls, especially since this is an elven kit. It fits. - Restricted to splint Mail seems like not much of a restriction at all. Assuming this is a Ranger kit, I would drop it to studded leather - this kit is all about flexibility, maneuverability, kiting... not tanking. - Also assuming it's a Ranger kit, I would disable druid spellcasting. It seems like this kit focuses its magical prowess into its enchanted arrows; that is a reasonable trade-off that makes sense story-wise. - The abilities are very powerful and come at very early levels. I would move them back... or at the very least, just make them usable once per day, rather than once per x levels. (You don't need to use them in every fight over the course of a day - you also get huge combat bonuses all the time, and there are plenty of magical arrows to use.) Once per day is plenty, and the ability to take more via HLA is a nice boost. - Death arrow seems awful close to a 'win button' ability. First, I would eliminate the penalty to save. Second, if it doesn't come til close to 20th level you should just make it an HLA. It looks like an HLA, and is actually more powerful than lots of HLAs. - Finally, I would remove the Whirlwind HLA, because 1) it's description seems more geared to melee weapons, and 2) WW + any of these abilities (especially the one-shot-kill arrows) = some super-smelly win-button cheese. These seem kind of skin to magical 'called shot' abilities - they seem like abilities that require focus and concentration. Doing it ten times in six seconds kind of ruins that idea. Bleh, I forgot to say anything about this. No, it's not a ranger kit, it's a fighter. I considered making it a ranger, but I didn't want to step on the Archer's toes in that regard. Technically, yes, which is why I tied it to DEX (which ranged characters need a high amount of anyway) and INT (which is mechanically useless for this kit since it can't dual). This is mainly for theme, though if it's a problem I will change it. Again, this is a fighter kit, my bad for not clarifying. The AA is a LOT more fragile than the Archer (d8 instead of d10 if I can figure out how to implement it, no Armor of Faith, no Hardiness) so I don't think this is a huge deal. In addition, one of the best armors for non-plate users, the Shadow Dragon Scales, is available for both classes anyway. This is a valid point. I'm trying to find a good middle point (this should feel like a ranged fighter with some ability in magic. Imbue Arrow will probably be nerfed, and Arrow of Death as well. Probably not merely 1/day, but I may bump them back a few levels and move it up to 8-9 levels. By the time you get Arrow of Death, -2 is... good, but not spectacular. A mage would have Finger of Death at this point. Still, multiple Fingers of Death in a round does sound a bit much for an already competent fighter, you're right. Refer to below about what I could do to nerf it. Finally, I would remove the Whirlwind HLA, because 1) it's description seems more geared to melee weapons, and 2) WW + any of these abilities (especially the one-shot-kill arrows) = some super-smelly win-button cheese. These seem kind of skin to magical 'called shot' abilities - they seem like abilities that require focus and concentration. Doing it ten times in six seconds kind of ruins that idea. I'll consider this, but also keep in mind that all the abilities last for 1 round only, so unless you're using Improved Alacrity, in which case you're a dirty cheater :P there should be no way to stack WWA with any of the AA's abilities. I am very inclined towards disabling WWA for this kit by the way. What I could try to do is make it so the abilities set your attack per round to 1 for the duration, and prevent means of increasing it, or I could give the abilities an actual cast time. For the next round, the arcane archer only has one attack, but targets must make a save vs. death or die. 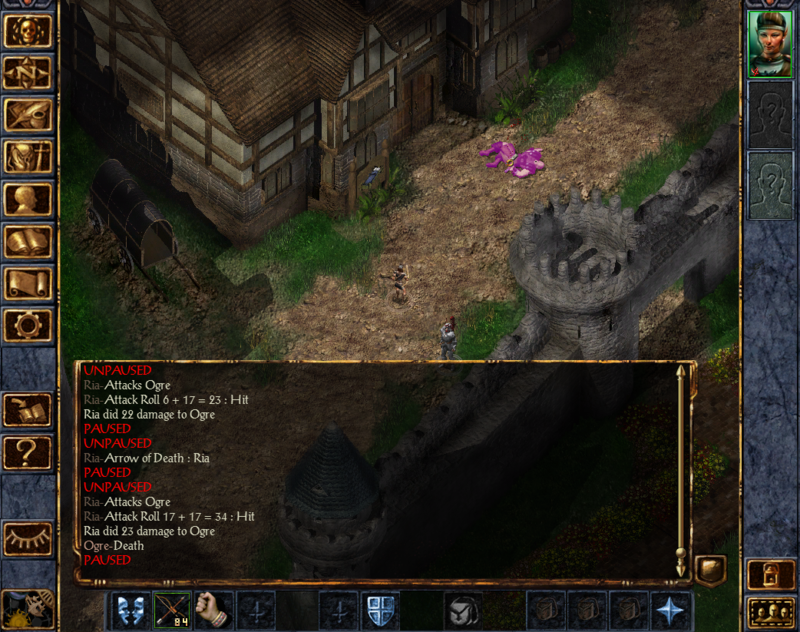 The saving throw becomes -1 at level 21 and -2 at level 28. I'll put up the change for the ability soon. Try experimenting with SLOT_AMMO3. It's the 4th ammo slot, invisible in the character screen, but as long as you have at least 1 other appropriate ammo equipped, you can right click a launchers ability icon to select which ammo to use, and it will show up. You can use this slot to create the different the types of arrows, without worry of overwriting any normal ammo, and also restricting each special arrow to only 1 use, hit or miss. You can also use it to create properly enchanted arrows, though it's a bit complicated unless you just give them an unlimited amount per day. keep in mind that all the abilities last for 1 round only, so unless you're using Improved Alacrity, in which case you're a dirty cheater :P there should be no way to stack WWA with any of the AA's abilities. I am very inclined towards disabling WWA for this kit by the way. Doesn't WW last for 2 rounds? (In which case you could activate WW, then activate Death Arrow, then get one round of 10 Death Arrows.) Or am I imaging that? If I'm wrong and WW only lasts 1 round then forget what I said, my mistake. I do like the 'set APR to 1 for this round' feature though, it could lead to some very tense "must... make... this... shot!" moments. I think the stat minimums just aren't worth it, because of BG's weirdness with stat rolls. Anyone taking this kit is going to max out DEX anyway, so setting the minimum just gives them free points. Likewise with INT... it's not a stat that a warrior class will use much, but this is just giving them free points. Very much an advantage, not a disadvantage. I guess you want decent INT because it involves magic... maybe set both minimums to 9 or so (same as a base Fighter's min STR, and a base wizard's min INT) would make sense. Rangers = woodsy, elves = woodsy, this kit = elvish, therefore it makes sense for this to be a ranger kit. Plus, the fighter class is kind of defined as being the most non-magical one, whereas rangers already have some magical abilities. Trading one kind of magic ability for different magic abilities feels more right to me than giving magic where there was none before. Further, Ranger Stealth fits nicely with the tactics of a kit built for archery, and with the classic idea of elves melting out if the forest and suddenly plinking you with arrows. Finally, given all these magic powers, I think the Ranger/Paladin XP table is best for this kit. It just feels like those classes. That's one of the most basic trade-offs in the game: special abilities for slower development. All just my personal opinion and hopefully constructive critique, of course. Nice work, in any event. Enjoy! the kit does not apear in char creation. @BaneBoneDust Uh, no idea. I made this kit ages ago, but it was working last I checked. I'll look it over later and get back to you. @BaneBoneDust I just downloaded it and it installs and runs fine. Did you get any install errors? It will also only show up for an Elf or Half-Elf and it is a Fighters kit, not a Ranger. I'm officially abandoning this mod. It's a glitchy, hastily cobbled together, badly balanced mess that really doesn't meet my standards. I'll make a better one (with an Enchanted Weapon-style ammo forging system). Stay tuned.